Advancing 3D technology combined with skilled craftsmanship offer watch designers an increasingly-rich language of form. This very attractive Dior VIII Grand Bal Plume has a 36 mm case of polished steel. 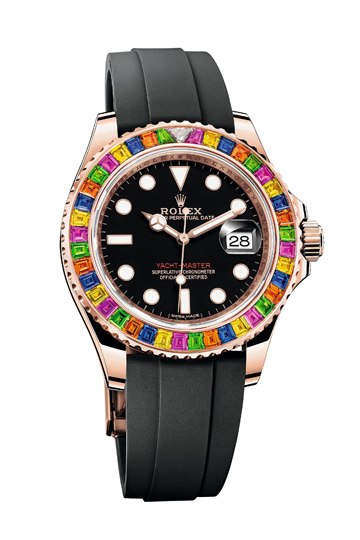 The bezel is decorated with a yellow-gold ring and brilliant-cut diamonds. 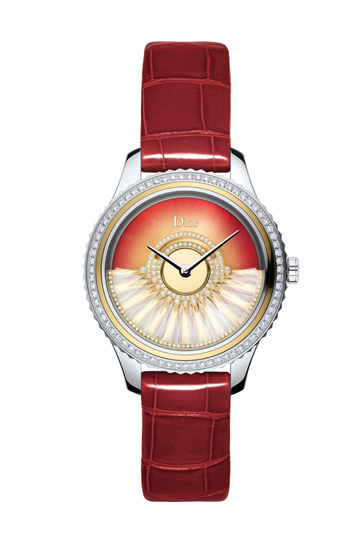 The yellow-gold dial is embellished with a transparent red lacquer and small feathers. The rotor of the automatic movement, exclusively developed for Dior, allows the feathers to move rhythmically with the elegance of a haute couture ball gown. The attractive bows – set with brilliant-cut diamonds – on this Velvet Ribbon immediately catch the eye. 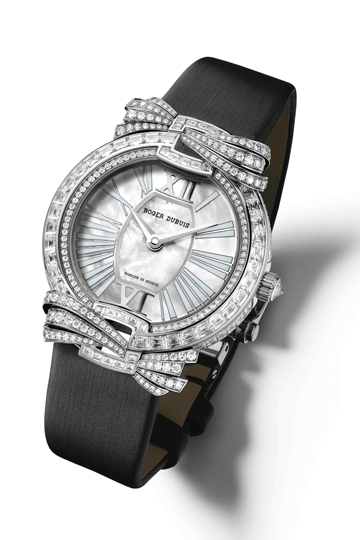 They are connected to the bezel of the 36 mm white-gold case that is decorated with baguette-cut diamonds. In total, there are 385 diamonds on this watch, which has a mother-of-pearl dial and is powered by an RD821 automatic movement. 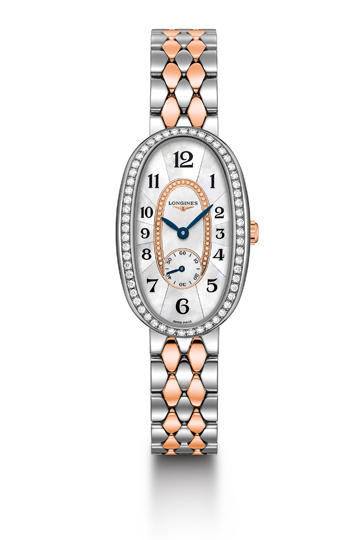 The remarkable, oval, 4 mm diamond-set steel case of this Symphonette radiates a totally classic elegance. The bicolour design of the steel bracelet with its pink-gold gilded links is carried through to the crown and the dial of inlaid mother-of-pearl. The Symphonette has a quartz movement. 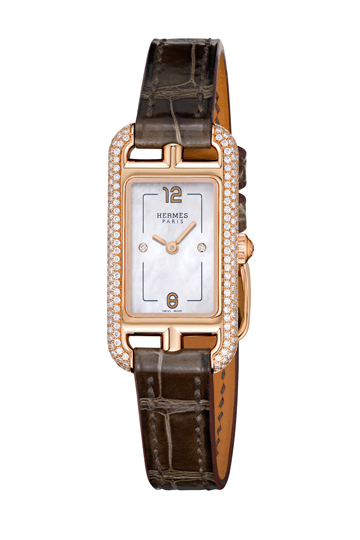 A pink-gold TPM edition of the Nantucket, a model that Hermès has included in its collection since 1991. TPM stands for Très Petite Modèle and this is confirmed by the case measurements: 17 x 23 mm. 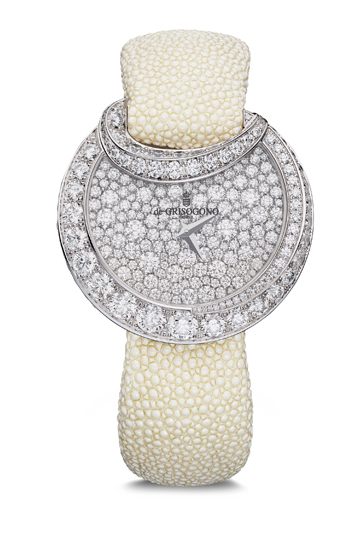 And yet the case and the mother-of-pearl dial are set with a total of 186 diamonds. The watch has a quartz movement and a crocodile-leather strap. Harmonious forms dominate the design of this Luna, from the studios of Fawaz Gruosi, the Italian-Lebanese jeweller who founded De Grisogono in 1993. Gruosi’s aesthetic designs are distinctive due to their striking details and rich colour – or the expressive presence of black or white, often in the form of diamonds. And this is also found on this Luna, with its white-gold case set with diamonds in 35 different sizes. Inside this Luna, with its white, sharkskin strap, ticks a quartz movement. 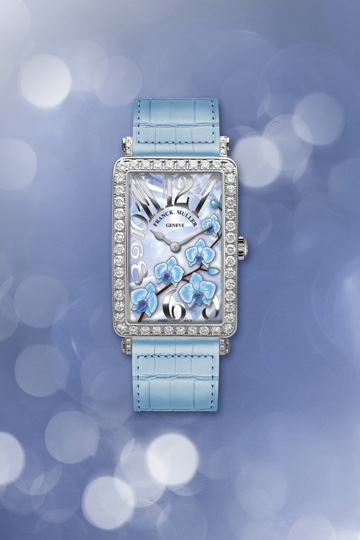 An orchid weaves its way through the graceful figures on the mother-of-pearl dial of this elegant Long Island. The blue, pastel tints of the flowers and the matching crocodile-leather strap form an attractive blend with the rectangular, 32 x 42 mm steel case set with diamonds, in which a quartz movement is placed. On the bezel – which turns in two directions – of this Oyster Perpetual Yacht-Master 40, green tsavorites and sapphires in varying tints create a rich play of colour. A triangular diamond accentuates the 12 o’clock position on the bezel which, like the case, is made of Everose gold, an alloy created exclusively for Rolex. This watch has a Rolex automatic 3135 movement and an elastomer Oysterflex bracelet.